Today may just be your lucky day! The Six of Pentacles is a card of giving and receiving, sharing the wealth, being willing (and able) to lend a hand to others while being open to receiving the same for yourself. You may run into unexpected good fortune or find yourself the recipient of someone else’s generosity. Or if you’re in a position to help someone else then by all means do so. 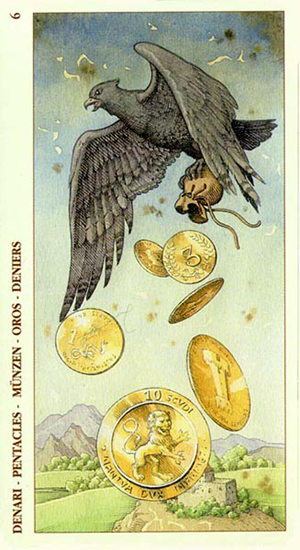 This version — from the gorgeous Tarot of Durer — shows an eagle flying high with a sack full of coins and dropping them from overhead. They scatter in multiple denominations onto the kingdom below. The Six of Pentacles is about giving and receiving. It’s about sharing. It’s about random acts of kindness. And it’s about the exchange of energy — which often takes the form of money or financial assistance. This is something to think about today. Kindness and consideration, compassion, generosity. But most of all gratitude. These are all Six of Pentacles attributes. This isn’t about giving what you can’t afford to give. That can create hardship and ultimately resentment. And it’s not necessarily about giving money anyway. Whether you’re the benefactor today or the recipient, know that this is a never ending cycle and you’ll find yourself in both roles. Be prepared to jump in and participate fully — either through offering help to another or expressing gratitude for the help you receive. The Sun moves into Cancer today, marking the Summer Solstice and the longest day of the year, measured by the amount of time between Sunrise and Sunset. This is true for those in the Northern Hemisphere; it’s exactly the opposite (Winter solstice and shortest day of the year) for those in the Southern Hemisphere. When we think of the Sun, we think of warmth, light and life. It warms our spirits as well as our bodies; it brightens our moods as well as the outside world, and it brings life to our dreams and goals as well as to every living thing on the planet. The Sun card in the Tarot is much the same way. It refers to the wonder and glory of being alive. Of feeling warm, confident, radiant and spirited. Its attitude is that “everything is as it should be” today, for you and in the world around you. 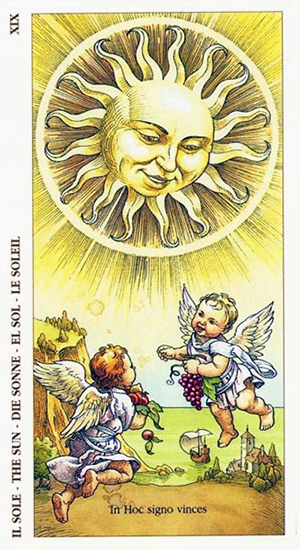 The Sun in this card — from the gorgeous Tarot of Durer — smiles down on two tiny angels hovering over a tranquil landscape. In the distance you can see a Kingdom set high on a cliff, and below it a sailboat gliding through the water. But front and center, in the here and now, the focus is on these two little cherubs. They are “in the moment” basking in the warmth of the Sun’s glow and partaking in the earthly bounty that is theirs for the taking. Offsite things may not be so picture-perfect. We know that there are evils in the world, poverty, sickness and war. We know that it’s not always so easy to live in the moment or be happy with what we have. And this is where the inscription at the bottom of the card — In Hoc signo vinces — comes in. This phrase translates from Latin into “By this sign you will conquer.” It was seen in a vision by Constantine the Great and his army just before a victorious battle. Later on it was chosen as the motto for the Knights Templar. It means that while there are hardships and difficulties all around us, we do have the power to rise up and overcome. As we move into the Solstice today and embark on a new season, take the time to think about what is right in your world. What hardships you’ve been able to overcome and what messages you’ll want to carry forward. The Sun card reminds you that there is much to be thankful for and that spreading your own warmth onto others can go a long ways toward healing our planet. Today you may encounter someone who inspires you to open up your heart and express your true feelings without fear or censure. This could be an individual in your life (male or female) or it could describe qualities that you yourself need to develop. Qualities like love, affection, romance, and emotional expression. The Knight of Chalices (Cups in most decks), while not exactly the proverbial Knight in Shining Armor, does have a certain romantic sweep-you-off-your-feet vibe. He’s ardent and passionate with a lot to say and a colorful way of saying it. He may be “in love with love,” in which case he’s apt to be better at the hearts and flowers aspects of romance than he is at the nitty gritty. Notice that this Knight is charging off on some unknown adventure with his chalice raised high in the air. He’s likely following his heart — and will go to the ends of the earth to find what he’s looking for. There is a bit of a dramatic flair associated with this Knight. He can be chivalrous and gallant when he needs to be. Or when the mood calls for a softer approach he can be sensitive, caring and kind. If this is someone in your life, you will know him by his charm, sensitivity, and emotional availability. He wears his heart on his sleeve and has no problem expressing feelings. He may reach out across the miles or send messages of love and affection from afar. There you stand so grand and tall with all around you that you could ever need but what has it “cost” you? Notice the shield you are standing on did you get to the position you are in from pushing you way up the ranks to the top of your field as this image implies. Perhaps you are thinking of a career change or doing something differently to make money just now and if this is the case you also need to look at your motives in why you are doing so. Will it be a job, career or occupation you love? Something you can pour your heart into? Or are you just taking this path because you need the money and it pays well? Doing something which pays well but brings you no happiness or satisfaction can be mind numbing after a while and you don’t want to be stuck like that for long. 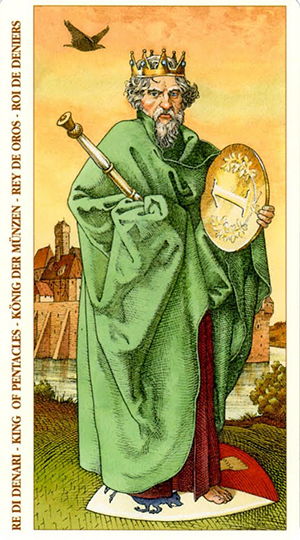 There is a fair degree of growth around for you just now as can be seen in the green flowing robes and you also have the power to wield that growth in any direction you wish it to go hence the object in your right hand which looks remarkably like a wand. The moat around the castle in the background shows that you have already worked long and hard for what you have and are willing to protect it in any way you can. You may be feeling a sense of urgency today — to chase after your goals, deliver an important message or reach some objective that you feel time is running out for. 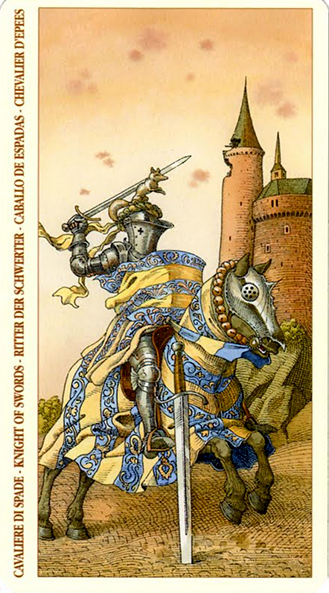 The Knight of Swords is a fearless and driven individual who can be so intent on pursuing his goals that he fails to see any obstacles in his way. In some ways this is a blessing in disguise: in the “what he doesn’t know can’t hurt him” vein. But the downside of the mind-set is an inability to see what (or whom) he’s trampling over in his single-minded quest to get to the finish line. The Knight of Swords can be aggressive and abrupt. He’s no-nonsense and no-BS and is unlikely to worry about sparing anyone’s feelings. He’s also not someone you can reason with or who will be deterred by emotional displays. 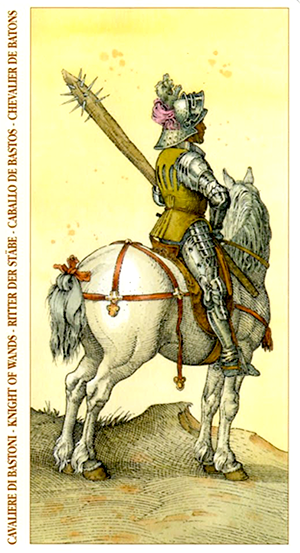 In this version of the card the Knight and his stallion are both wearing armor — and both cloaked in royal attire. The Knight raises his sword and rears back on his horse in a gesture of defiance. A second Sword has been thrust into the ground in a symbol of triumph. The spoils of war are behind him. As with all the court cards, this may be someone in your life or it may be a set of attitudes that you need to adopt. If he’s someone in your life — especially someone you’re at odds with — your best bet is to just get out of his way. He can be combative and contentious, which means that you’re not going to make any headway in getting your views across. Today you may have to reach into your inner reserves of confidence and courage to go after your dreams. The Knight of Wands is all about passion, inspiration and adventure. You may have taken the seed of an idea (as seen with the Page) and turned it into a workable plan. This isn’t some far-fetched scheme. It’s a goal you can actually see yourself reaching at some point in the future. This Knight of Wands is more composed than so many of the other versions. Rather than rearing back on his steed and charging off toward the horizon, this one trains his eye on far-off vistas, measuring the steps it will take for him to get from here to there. You may be considering a major undertaking: going back to school, launching a new career, embarking on a spiritual adventure, etc. Whatever it is, know that it will serve you well to adopt a similar stance. While there is a definite “spirit of adventure” associated with the Knight of Wands, it helps to pace yourself (like the version in this card) rather than to charge off after something that you haven’t quite figured out. You can’t know all the answers: even this Knight doesn’t know what’s on the other side of that cliff. But you can increase your odds of succeeding by adopting a “look before you leap” attitude, for this or any venture. 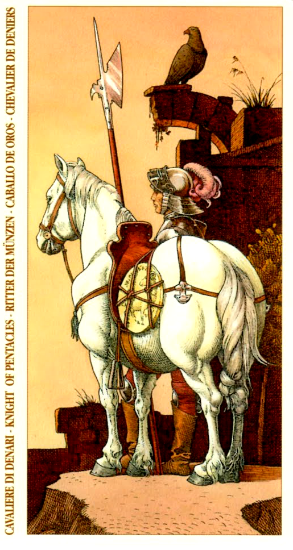 The Knight of Pentacles is all about taking things slow and steady, with a keen eye on the future and the discipline to keep “plodding along” as he moves toward his ultimate goals. As with all the court cards, this can be someone presently in your life (or coming in) or it can represent a frame of mind that’s necessary for you adopt right now. Don’t make the mistake though of focusing too much on the nuts and bolts of achieving success. If there’s any negative aspect that can be associated with this card it’s the dearth of inspiration that can lead to getting stuck in a rut of tedium and routine. 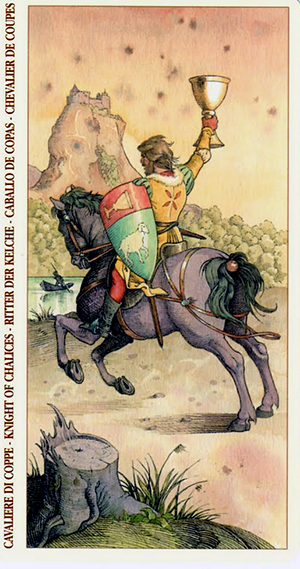 In this version of the card we see the Knight of Pentacles staring off in the distance with his faithful horse at his side. He can see that there are some hurdles to cross to get to where he wants to go, and rather than mounting his horse and making a run for it, he pauses to reflect on the best way to go about it. Notice how he keeps his money (the pentacle strapped the horse’s side) secure and his weapon at the ready. This is a cautious Knight, and not given to taking unnecessary chances. A messenger pigeon is perched on the crumbling archway above him, looking off toward the distance as well. The suit of cups denotes feelings and the Ace of Cups is no exception. It speaks of love. Whether this is love of self or love within a relationship it forces you to look at it and what it means for you. 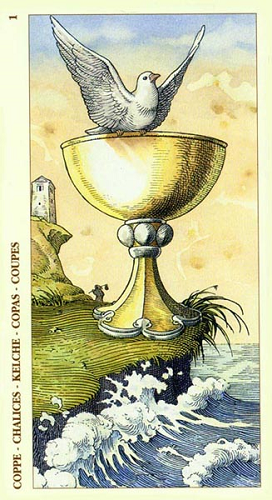 In this version of the card we see a white dove perched precariously on top of the cup which looks as if it is about to tumble into a stormy sea. Water (the sea) stands for emotions and these are looking a bit turbulent as the waves break onto what is left of the headland upon which the cup sits. You may wish to keep in mind that even though things within your relationship (or within yourself) are not all smooth sailing you can endure through most of it and stick things out for another day (as with the farmer in the background who has been attending the fields). Underneath the cup is the field the farmer has been attending to. Look at all the hard work he has put into it only leaving a few weeds out towards the headland overlooking the sea. Love sometimes is not all smooth sailing. There are ups and downs and there is endurance where both people know each other so well that there is no need to speak things through as the underlying feeling of love between them means they know the relationship will endure even through hard times and they’re both willing to put the work into the relationship to make this happen without the need for a “pat on the back” or acknowledgement from their partner. Today’s card — the Five of Pentacles — indicates a need to rethink what you value, especially when it comes to your own sense of worth or self-esteem. 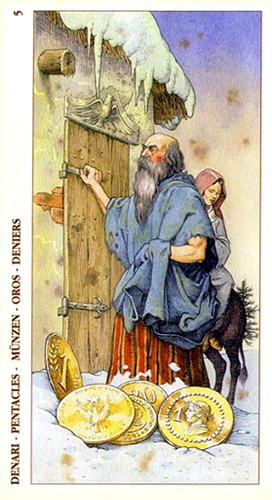 In this version of the card we see an old man standing in the snow outside a closed wooden door. His clothes are shabby and worn, inadequate against the cold. His wife shivers on their mule behind him. There are five gold coins scattered on the ground beside them. They don’t even seem to notice the coins. The woman seems dejected and uncertain, and her husband seems hesitant to knock. Perhaps they’ve been turned away before and have come to expect the same this time. This card is tied to Saturn in Taurus or the second house. 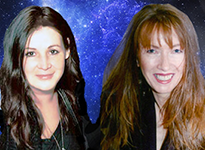 Astrologically this relates to hardship and turmoil, business failings, loss of revenue, and financial decline. But it also says a lot about personal values and self-esteem. We don’t always realize how connected these are to one another. In this respect the Five of Pentacles can also refer to feelings or loneliness or rejection. But like the couple in this card, you don’t want to make that assumption before you discover it to be true. They could just as easily find comfort, community and warmth on the other side of that door. Today’s card — the King of Cups — is all about getting in touch with your emotions and learning to express them in a healthy mature manner. The Kings — as with all of the court cards — will often describe an individual entering your life as a facilitator for an important lessons. In this case as it’s Cups (called “Chalices” in this deck) that lesson refers to the realm of feelings, emotions, instinct and intuition. The King in this version is seated on a throne that rises of the ocean like a pedestal. His robes are ornate although somewhat weathered. His crown and his chalice are both gold. An elephant and a seahorse adorn his shield — a clear reference to his reign over land and sea. Although this King is kind and compassionate, he’s nobody’s fool. He’s not easily persuaded or manipulated and he doesn’t get caught up in maudlin sentimentality. The seas around him may be turbulent, but he maintains his calm as he keeps a watchful eye on the horizon. 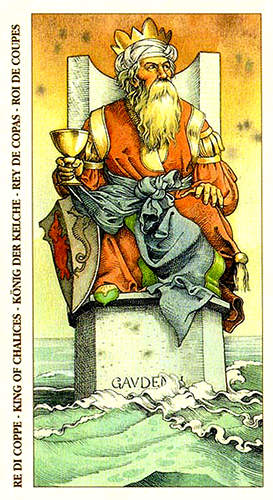 The King of Cups encourages you to be compassionate while still maintaining an air of authority. It speaks of developing a clear emotional radar without becoming wishy washy. And it speaks of getting a better understanding of your emotions without becoming overpowered by them.